As compared to some forage crops, winter annuals (including annual ryegrass, small grains, annual clovers, and Brassicas) are relatively easy to establish and are generally dependable, but failures do occur. Here are nine common reasons for stand failures or poor production in annual winter forage. Soil acidity, or low soil pH, is a common problem. For most winter annuals, the soil needs to be limed enough to bring the pH to the range of 6.0 to 6.5. Ideally, this should be done a few months before planting. Fertilization should be completed according to soil-test recommendations. When planting on a prepared seedbed, it is usually best to incorporate fertilizer into the seedbed just before planting. When overseeding summer grass sods, it is best to wait until the winter annuals have emerged before applying fertilizer containing nitrogen because this reduces the chance of stimulating competition from the summer grass. Drought, freezing, and heaving are among the weather-related problems that can damage winter annual stands. We can’t change the weather, but often we can make weather-related problems less likely. Being ready to plant when conditions are right is often a major advantage. This includes having the proper seed on hand, having land in suitable condition, and making certain equipment is ready. Sometimes a difference of only a week or so in planting dates can make a big difference in how a stand turns out. If any needed soil amendments have been applied and climatic conditions are favorable, germination and seedling growth will be rapid. Once seedlings have a good root system developed, their ability to withstand stress increases considerably. All seed planted should be of a species and variety known to be adapted to the environment and productive. If mixtures of species are planted, they should be known to be compatible with each other. Getting a good forage stand also requires using high-quality seed. Using seed of unknown quality is dangerous business. Seed purchased through established seed channels should be labeled so that germination and other seed quality traits are clear. Germination tests should be run on seed that is not labeled or that has been held over from a previous year. Seed cost is a minor portion of the cost of establishing any forage crop. Cheap seed is rarely a bargain. Legume seed needs to be inoculated with the specific Rhizobium bacteria suited for the legume being planted. Most legume seed is pre-inoculated with the proper type of bacteria. If not, it should be inoculated by the producer immediately before planting. Planting winter annuals too early on a prepared seedbed can expose the seedlings to excessive heat; planting too early on a summer grass pasture can allow the summer grass to out-compete the winter annuals. 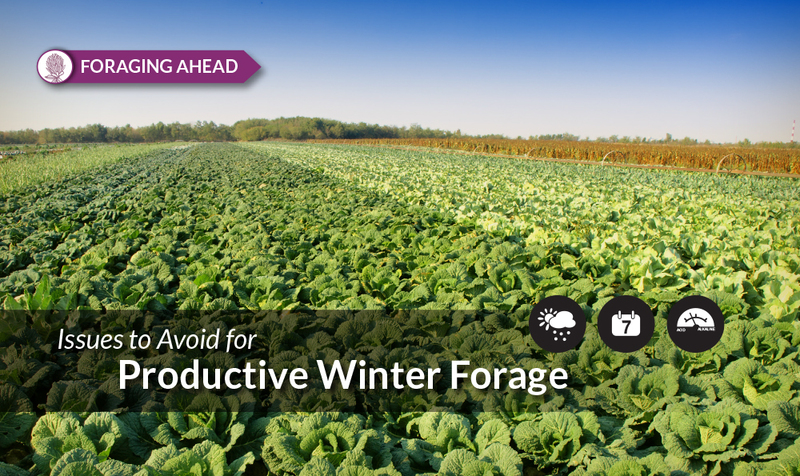 Planting too late reduces autumn forage production and increases the likelihood of freeze damage and heaving. Optimum planting dates vary in different geographical locations, so recommendations from a credible source should be consulted. Planting seed too deeply can preclude seedling emergence; planting too shallowly can unnecessarily expose seed to harsh conditions. A “rule of thumb” is that a given type of seed should be planted no deeper than eight times its diameter. Land where clovers and other small, dense seed are planted on a prepared seedbed should be cultipacked (firmed with a roller) to avoid settling of seed after planting. Insects that can damage winter annuals include crickets that may consume young clover plants, aphids that reduce the vigor of many plant species, and especially fall armyworms that often attack young stands planted in early autumn. The point is that it pays to monitor recently planted stands on a regular basis. The most common reason for failure in overseeding winter annuals is excessive plant residue being left on the field. Research has shown that it is preferable to have summer grass stubble down to a height of one inch or less, if possible. This is especially important with small-seeded forage species such as ryegrass or clovers. Close clipping, heavy grazing, tillage, and fire are approaches that might be used to reduce plant residue on the soil surface before overseeding winter annuals. Grazing too early on a prepared seedbed can result in extreme damage from hooves, especially if the soil is wet. In addition, if seedlings have not had time to develop a good root system, livestock may pull up the plants, roots and all. Winter annual pastures should normally be allowed to reach a height of 8 to 12 inches before grazing is initiated. A few other problems sometimes occur with winter annual forage crops. However, elimination of these nine would probably result in a success rate close to 100 percent. Foraging Ahead is a biweekly column presented by Ragan & Massey and written by Dr. Don Ball, Professor Emeritus at Auburn University. Dr. Ball is one of the authors of the popular book “Southern Forages,” available here.